Female travellers are often believed to be easy targets for theft when they are travelling abroad. Jewellery, laptop computers, electronic equipment, cameras, business papers and passports are all treasures that thieves covet. But there is much that women can do while travelling to ward off would-be thieves. Maintaining proper security on transportation, in the hotel room, public bathrooms, bars and restaurants and on the beach is critical for women to avoid becoming victims of theft. It may seem as though attempting to steal from someone on public transportation would be ludicrous since, after all, there’s no where for a thief to run. Rarely does this fact deter a determined thief. Theft does occur on planes, trains and buses. Women can usually avoid theft on public transportation in two easy steps: staying awake and keeping their bags with them. If bags do need to be moved, women should try to stow them under the seat in front of them or under their own seat with the straps of the bag looped around their ankles. If at all possible women should remain awake and alert to their surroundings. For women travelling in groups, taking turns to stay awake will help protect everyone. Some hotel rooms are more secure than others, but women can help to avoid theft regardless of where they are by using some common sense. If a private safe is available women should use it and key in a code that is not obvious (avoid birth dates, travel dates, etc.). If a safe is not provided, women can inquire with the hotel to see if there is a safe in another location in which to store their valuables. Items that are not stored in the safe should be removed from plain view of the windows and stored neatly in luggage. If a woman enters a hotel room shortly after leaving and finds “maintenance” people in her room, such as to fix a tap that was not leaky or a television that was working perfectly, she should check her valuables immediately and report any theft to the police. Unfortunately not even bathroom stalls are a safe place for females. 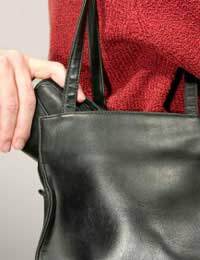 Theft has been known to occur when a woman sets down her handbag on the stall floor, hangs it from the provided rack on the stall door or even sets her bag down while washing her hands. To avoid such theft women can hang their handbag from the door lock (if it does not hang down under the door) or place it on the back of the toilet (laying down toilet tissue first is probably a good idea). While washing their hands, women should wear their handbags as normal to avoid having to set them down. Many women let their guards down in bars and restaurants and if alcohol enters the mix then personal security can become even more lax. Women using such facilities should avoid draping their bags over the back of their chairs or placing them under the table. If women will be draping a jacket or sweater over the back of their chairs they should remove all valuables from the pockets first. Some thieves also try to use distraction on their intended victims, so if someone knocks over a plate or glass, especially if the contents fall onto a woman’s person, then her first instinct should be to reach for her valuables. Security on the beach or around the pool can be risky because in order to go swimming a woman must leave her valuables on dry land. To cope with this situation, women should leave valuables in her room. If she does go swimming, a woman can ask a travel companion or another guest to mind her bag. Carrying little cash and instead signing for drinks or meals on her room bill is also a good idea. If, despite such vigilant safety precautions, thieves are successful anyway, women should report the theft immediately. If the theft occurs on transportation or in a hotel then it can be reported to the management officials, but involving the police is still crucial because many insurance companies require a police report to process a claim. If a woman prefers to speak with a female police officer or needs a translator then this should be made clear from the start. All credit card companies should be alerted immediately if cards are stolen, a woman will need to contact her bank if an ATM card is taken. If travellers’ cheques are stolen then a woman can contact the issuing company to make a claim. Finally, a woman will need to contact her nearest consulate or embassy if her passport or other travel documentation has been stolen. Government officials will then be able to offer advice on how best to proceed.